1) One of the major difference between these two keys is that primary key enforces clustered index, which is the actual physical order of how data is stored in the disc. On the other hand, Foreign key doesn't create a clustered index in the table. 2) The primary key is unique in the table. So a table cannot contain more than one row with the same primary key, but that's not required for foreign key. You can have more than one rows in a table with same foreign key e.g. all employees will have a unique id but many of them working for the same department will have the same dept_id. This is one of the main difference between a unique key and a primary key. 3) Foreign key helps to maintain the integrity of related tables in the database. For example, it's not possible to delete a department, unless a single employee is referring that. So, an accidental delete of such department will be prevented by database management systems e.g. Oracle, MySQL or SQL SERVER. You can further setup cascade actions with foreign key e.g. when a department is deleted, update the dept_id of all employees in Employee table referring to this department. You can setup such arrangement using ON CASCADE clause. Similarly, you cannot insert the data in the secondary table if a row with the primary key doesn't exist in Primary key e.g. adding a non-existent department to an employee's profile. This is also known as referential integrity in the database. 4) Another key difference between the primary and foreign key in a table is that primary key cannot accept null, but the foreign key can accept multiple values. 5) The Primary key uniquely identifies a record in the table, but the foreign key can not be used for that purpose, it's just the primary key of the related table. 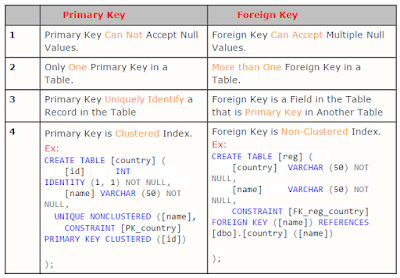 That's all about the difference between Primary and Foreign key in SQL. It's one of the most important concepts in a relational database and a good understanding of this is required to manage or retrieve data from a commercial database like Oracle 11g or Microsoft SQL SERVER 2014. 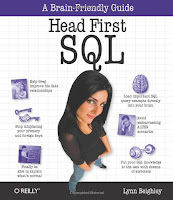 It's important for a beginner to understand these key SQL concepts, if you are just starting SQL, then you should check out the Head First SQL book, one of the best books to learn SQL.